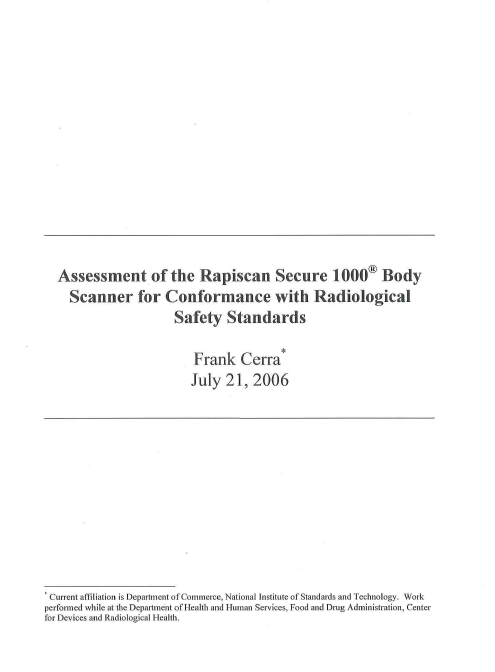 The system tested was the Secure 1000 manufactured by Rapiscan Security Products, Inc., Hawthorne, CA. The system was received by CDRH for testing on 3/29106 and had the following identification markings “Serial No. : S701201213”, “Date: May 2001 “. The label also included the following statement: “Each scan cycle from this system produces 3 microRem of x-ray radiation emission. This value is comparable to the radiation exposure all persons receive each five minutes from naturally occurring radioactive materials in the air and soil.” The system tested included a back plate and floor panel. The back plate was measured to be 153 cm wide by 242 cm high. When positioned against the floor panel the back plate surface was at approximately 89 cm from the front surface of the Secure 1000 cabinet. The exposure received from a scan is the most important information needed to determine effective dose. Exposure measurements were made by scanning the 1800 cc, 1OX5-1500 ion chamber. 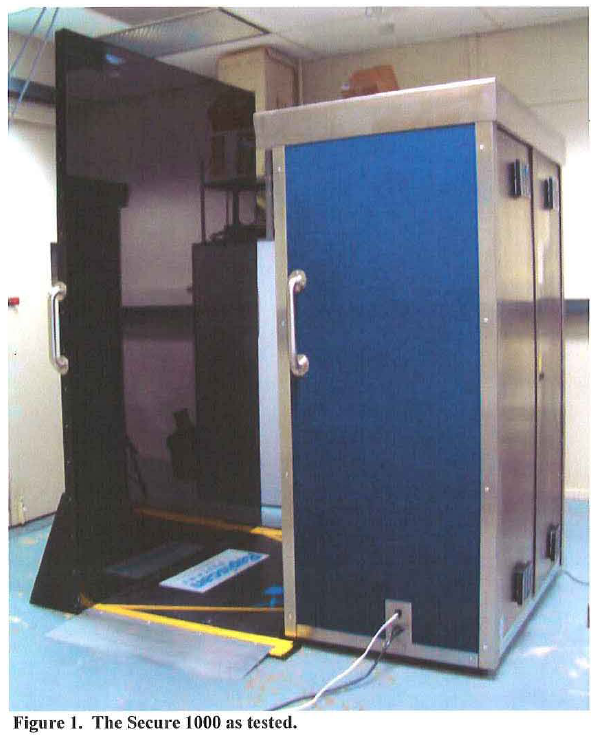 The ion chamber was centered at 30 cm from the front surface of the Secure 1000 cabinet. The ion chamber averages the exposure over its sensitive volume, which extended from about 23 to 37 cm from the front surface. Measurements were also made with a 1 x 1 cm solid state detector, RTI R 1 OOB, to map the exposure profile of the scan field. Both instruments were calibrated in the CDRH X-ray Calibration Laboratory at 50 kV and I mm Al HVL (corresponding to the NIST M50 beam quality).